Ghani did, however, ask Washington to continue funding the Afghan military and slow down the withdrawal of US troops, which the Obama administration intended to complete by 2017. There are currently nearly 10,000 US troops in Afghanistan, almost half of which are scheduled to withdraw by the end of the year. 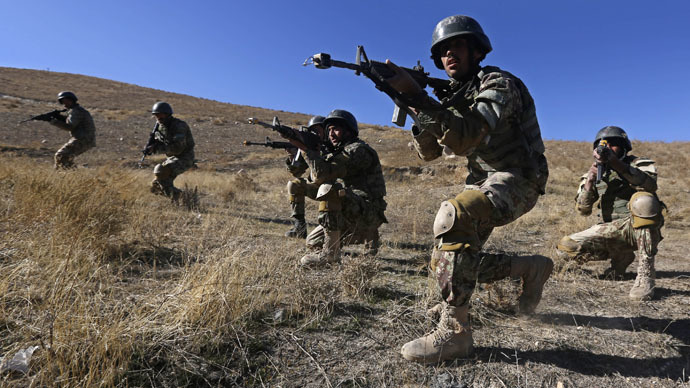 But Ghani has pressed for US troops to stay in the country longer, citing fears of Islamic State advances and ongoing battles against the resurgent Taliban. At the peak of US involvement in Afghanistan, there were 130,000 US and NATO troops in the country. Combat operations officially ended last year, leaving a shrinking US force with a mission to train Afghanistan’s 350,000 soldiers and police. Due to heavy attrition, the actual number of Afghan security forces is closer to 330,000 at the moment, the official acknowledged. The cost of the commitment was $4.1 billion for fiscal year 2015, projected to fall to $3.8 billion for fiscal year 2016. The Afghan delegation spent all day Monday in meetings with senior US officials, including Defense Secretary Ash Carter and Secretary of State John Kerry. In addition to military funding, the talks touched on specific reforms Afghanistan would have to complete before receiving up to $800 million in US aid. Washington is eager to show that the new government in Kabul is reliable and competent enough to solve its own problems, while being appreciative of US help. Ghani’s predecessor, Hamid Karzai, came to power following the US invasion in 2001, but his relationship with Washington soured over the years. Karzai had refused to sign a treaty with the US and NATO before leaving office last September. Ghani signed the pact within days of taking office. Ghani is a graduate of the American University in Beirut and has a doctorate from New York’s Columbia University. From 1991 to 2001 he worked at the World Bank. He is married to a Lebanese-American he met in Beirut during his studies. Their children have American citizenship.